President George Bush signs the Americans with Disabilities Act during a ceremony on the South Lawn of the White House July 26, 1990. “It was the fair and right thing to do,” former President George H. W. Bush said in an interview in 1999 when asked why he supported the Americans With Disabilities Act (ADA), which he signed into law on July 26, 1990. In his remarks at the signing ceremony, Bush noted that there were 43 million Americans living with disabilities. ​The ADA bars discrimination against Americans with disabilities in jobs, schools, transportation, and all public and privately-owned places that are open to the general public. The signing of the legislation marked a rare moment of bipartisanship in Washington politics. Even the most hardened politicians, such as Lee Atwater, a senior Bush adviser who was considered a key architect of the “negative campaign” concept, supported the measure. 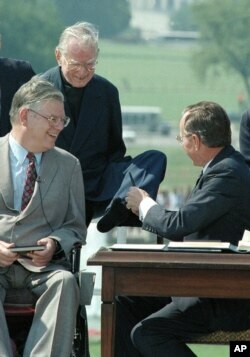 A priest with no arms attended the signing ceremony, using his feet to hand the president a pen to sign the bill. The Rev. Harold H. Wilke, top left, accepts a pen from President George Bush with his left foot, after Bush signed into law the Americans with Disabilities Act of 1990 at a White House South Lawn ceremony July 26, 1990. ​Before becoming law, the ADA faced some resistance, mostly by small business owners concerned about the cost of outfitting workspaces with the proper facilities to accommodate disabled workers. Since 1990, the ADA has been retooled, by former Presidents Bill Clinton and Barack Obama, as medical treatment for some chronic conditions like muscular sclerosis have dramatically improved. In the digital era, the challenges for disabled employees have shifted from building ramps for those in wheelchairs and making other office accommodations to unmet technical needs for others who cannot use computers without assistance. Millions of disabled Americans benefited from 1990 law, barring discrimination in all aspects of public life, including employment.